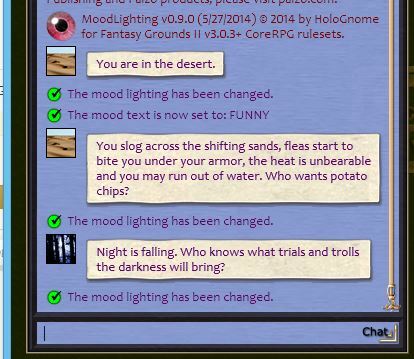 Attached is a fun extension for controlling the mood lighting of FG2 CoreRPG. It's still in progress with a lot more to do, but I'm at an interim point, would be very interested in your feedback and am happy to consider any requested features, etc. Download the file below. Supports up to FG3.1.5 - seems to work fine. - Added images for magic portals (not implemented yet) - red, orange, yellow, green, blue, violet, black, brown, white. Errata: This version displays the wrong image for savannah - fixed in next version. - The mood lighting includes changes to the color, mini-icons for each scenario, and short or funny messages. - The ability to independently set the window alpha transparency level (preserved across mood changes), something which is not currently possible with the chat window commands. I have tested it and it all seems to work OK without any issues. I hope you have fun with it, and I look forward to your comments. ps. For those of you who are lua experts, please feel free to provide lua feedback. I have never done any lua scripting until now and there may be things I'm doing that are not optimal. I have to say that lua makes me want to shoot myself with a potato gun. I simultaneously admire and loathe it, with the latter mostly directed at the syntax and missing features vs. other languages with which I am more familiar. Be that as it may, I have picked up some lua tricks in the process and think there is a lot to like about table-centric perspective, as well as the relative speed of lua. The code should be easy to follow and even has a built-in multi-color mini-debugger! NOTE: If you would like to enable the debugger, just do a global find/replace on "-- printDebug" -> replace with printDebug. It debugs to the chat window. Last edited by HoloGnome; January 18th, 2016 at 06:59. I'm just curious, was it not possible to hook and extend the existing slash command? Which one are you talking about? /lighting? It doesn't work properly (re: transparency)...also it is RGB value based, and it's not practical for everyone to remember RGB values. Also, bear in mind that, for me, this is an FG2 experiment and learning experience. If I have missed something grossly obvious, please tell me. I won't mind. I have only scratched the surface of FG2, but wanted to understand extensions and the lua environment. So, I wrote an extension. Last edited by HoloGnome; May 31st, 2014 at 23:46. I just meant for the presets, since you're creating a superset of what /lighting supports, can you modify /lighting to support the expanded list? I was mostly curious if there was a technical limitation, or if you didn't even look into that possiblity. Do you mean simply adding additional commands to /lighting instead of basing my extension off of /ml? I have not tried to replace any existing / commands yet, don't necessarily know if that works, and just assumed they would conflict. At the moment, /lighting doesn't work very well (not that it couldn't be fixed) - transparency is broken and the command does things it shouldn't, behaving in an uncontrolled manner. That being said, if it is possible to extend or override/replace /lighting without conflicting, I would have no trouble adding direct rgb support, since that's all it really does, as you say...but I also wanted a shorter command - the quicker the better from my perspective. I will look at it and also implement direct rgb + argb support (currently, I support alpha on its own and named modes that respect the current alpha setting as long as MoodLighting is the one that changed it), but it's an easy change to add rgb. Top level slash commands aside, have you tried it out yet? my only comment is you need more *fun/funny* in the "funny" comments! What? You don't like my jokes? This is just an initial functional milestone - there is a lot more to do. At the moment, there is only 1 "funny" message per mood. Most of the effort went into writing the code, then rewriting it after I had added a bunch of stuff, gotten the hang of lua, and realized that I needed to clean it up. I also spent a little time on UI/content/debugging, etc. Glad you like it and thanks for the feedback! I only found one or two that didnt say "It is now XYZ"
But the extension works just fine. Oh - you have to type /ml msg funny --> default mode is BASIC, which is what you were seeing. Last edited by HoloGnome; June 1st, 2014 at 05:19.